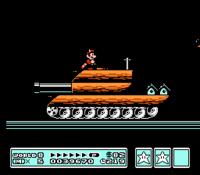 This article is about the tanks first appearing in Super Mario Bros. 3. For General Guy's vehicle from Paper Mario, see Toy Tank. Tanks are large, segmented and heavily armed land vehicles utilized by Bowser and his armies in Super Mario Bros. 3 and the television show. Tanks are equipped with various artillery, such as cannons, jet engines, Bob-omb launchers and Rocky Wrenches. In addition, some tanks were just mostly square in shape, presumably being the command tank due to the pipe on top. Their texture is the same as that of the airships in Super Mario Bros. 3. A tank from The Adventures of Super Mario Bros. 3. In Super Mario Bros. 3, only two tank companies, which guard Dark Land, appear, the first one being found in the kingdom's first area and the second in the last portion of it; the first company is composed of either 13 tanks (original/All-Stars version) or 10 tanks (Super Mario Advance 4), including one with a flamethrower, one super tank, and one with larger artillery) being commanded by a Boomerang Bro. The second company is composed of two regular tanks and three super tanks, the latter of which were named because they were far larger than normal, and is commanded by Boom Boom. In addition, airships were seen aiding the latter company, possibly implying that airships and tanks sometimes work together in the same company. In Super Mario 3D World, tanks appear in Bowser's Bullet Bill Brigade and Bowser's Bob-omb Brigade. 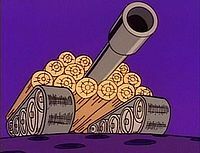 Tanks also appear in The Adventures of Super Mario Bros. 3 episode "Princess Toadstool for President"; here, several Tanks and Rocky Wrenches appear to attack Mario and Luigi when they enter Dark Land. In the manual for Super Mario Bros. 3, Lemmy's character quote mentioned that he heard that his father was developing a new weapon. Whether the weapon is the tanks, the small air force, or the battleships is not specified. In the level Frosty Fruits of Donkey Kong Country: Tropical Freeze, a tank that resembles the ones in Super Mario Bros. 3 can be seen in a window near the beginning of the level. ↑ Nintendo Power Strategy Guide for Super Mario Bros. 3, page 74-75 & 78-79. This page was last edited on March 2, 2019, at 15:14.